The idea was born out of managing this community for nearly 9 years and seeing the word “street” thrown around just a bit too liberally to where it has all but become a meme. There’s probably some lesson to be learned in there, as well. 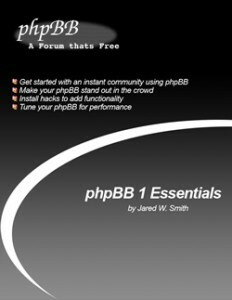 On phpBBHacks.com, we announced a new book titled “phpBB 1 Essentials.” phpBB is now in version 3 (3.0.7-PL1 to be exact) and the phpBB 1 string has not been updated since 2001. phpBB 2 was released almost 8 years ago and hasn’t been updated for more than 2 years. So, phpBB 1 is quite old. That’s not to say that it’s not used by some sites, in one form or another, because it is. But, the old and outdated nature of the software is a large part of the joke. This represented a collaboration with Jared W. Smith, my friend and former phpBBHacks.com Support Team member who co-authored the book “Building Online Communities With Drupal, phpBB, and WordPress.” I decided it’d be fun if he was the book’s author (with a foreword from me, of course!). He provided the cover, a complete throwback to some of the default “styling” that came with phpBB 1. The book had it’s own dedicated book page and was listed along with the other phpBB books (since removed). On PhotoshopForums.com, we capitalized on the buzz of Photoshop’s Content-Aware Fill functionality and announced Content-Aware Posting Assistance (CAPA) and Moderation (CAM). CAPA helps you to make sure you are using the right words, terms and details whenever you ask a question or answer one. It also can automatically generate an answer to your question based on previously posted content. If you need to include a screenshot, it’ll make you do so. CAM takes common moderation tasks and processes them automatically. If a thread is posted in a forum that is not the most appropriate choice, it moves it. If a thread has characteristics common with a spam or advertising message, it removes it. Finally, we have Bad Boy Blog. 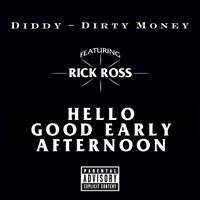 On March 30, Diddy released a new single from his group Dirty Money, titled “Hello Good Morning.” It’s an awesome song. I love it. Take a look at the cover, because it’s crucial to the joke. We reported that he would be releasing a series of remixes to the song. This included “Hello Good Late Morning” featuring Red Cafe, “Hello Good Early Afternoon” featuring Rick Ross, “Hello Good Late Afternoon” featuring Pharrell, “Hello Good Evening” featuring Nas and “Hello Good Night” featuring Jay-Z. We even had the covers. How did I have the covers? Well, I created them, using the original and identifying the font – Friz Quadrata Bold – which I had to purchase for $29. What can I say? I’m committed. As if that wasn’t enough, we caught an enormous and amazingly hilarious bit of luck. Rick Ross, one of the rappers I included in the fictional tracks, actually laid a verse to the song. And released it on April 1. Are you kidding me? We put up a follow up post, playing it as though that was the track we reported on, but in an unfinished form. When it came time, we broke down the joke and cleared everything up. So, that was my April Fools’ Day. What was yours? Did you pull any pranks on a community that you manage? Please let me know in the comments.